Arnoldo Cantu Jr. will remain County Court-at-Law No. 5’s only judge after facing his first challenger in more than a decade. Cantu received 56.43 percent of the total vote, garnering 23,965 votes to attorney Armando Marroquin’s 18,503. 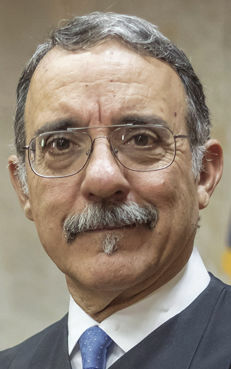 Cantu was elected to the court in 2002, which first opened its doors in 2003. He said the fact that he’s long run unopposed is evidence of the court’s effectiveness. Marroquin, however, ran on a platform of “positive change,” saying the court was not as efficient as Cantu made it out to be. Marroquin also took issue with Cantu outwardly saying during a candidate forum that he resolves issues with cases in his chambers, a practice Marroquin said lacked transparency. Cantu said he looks forward to getting back to work now that the campaign is over. Since he faces no Republican challengers in the November General Election he is guaranteed another four years in office. “The county courts are real busy; we typically docket 250-300 cases a week. Right now I’ve been very grateful to my fellow county court-at-law judges for helping out,” he said. Marroquin could not be reached for comment Tuesday night, but previously told The Monitor that he hoped his campaign, successful or not, would encourages others to run against incumbents in the future.